Uwe Schmidt has released music under many names, but in the '90s he decided to summarise his working titles into one simple moniker, Atom TM. HD is the latest release in what could be conservatively called a wildly prolific career spanning many years. 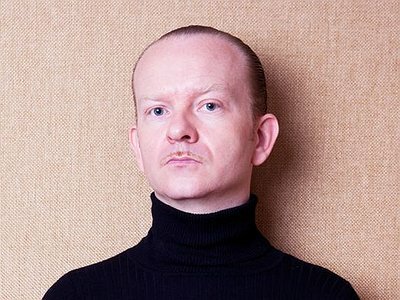 While Schmidt's album was released on Raster-Noton, it is generally considered that his own label Rather Interesting was the largest unified collection of his music with over 46 full length releases all written, recorded, mixed and mastered by Schmidt himself. To put it mildly, Schmidt doesn't see the dissolution and evolution of the music industry as a bad thing, and believes that the intensifying conversion of music and sound is not a problem that needs solving. Preferring the label 'sound' over 'music' as a way to describe the new reality of today, Schmidt hopes to overcome traditional understandings which will allow transcendence into new realms of pure physical and spiritual energy. I started writing/producing music around 1985. Before that I had just played drums, but switched to drum computer programming after I had heard a drum machine on the radio. I guess this must have been the biggest influence, since it really changed the way I saw music from that moment on. I got deeply into all sorts of electronic music after that. Listening to acid music for the first time, around 1990. Seeing a merengue band playing at a beach in Costa Rica around 1994. Hearing and seeing at the same time, sound waves on a "Funktion One" sound system. Managing the above listed incisive moments. There is no fixed rule or routine, really. I usually work on many things at the same time, therefore I collect all sorts of elements constantly: words, lyrics, samples, sounds, typographies, photographs, and so on. Each single one of those things may start a track or trigger an idea to start a new piece. Every now and then I just record a couple of words, around which the rest of the song is then assembled or sometimes assembles itself. In other cases it's a jam on a drum computer, or maybe a melody that goes around in my head while taking a shower. Very strictly. I am very aware of when to apply both methods. In general I consider composition a very clear and mental process. Most of it I do almost without touching any instrument, but rather put things together in my head. Then I would sit down and program, play or edit what I had in mind. There is very little space for improvisation during that process. That said, it is important that during the process of programming, one does achieve a state of intuition, where ideas and even improvisations can flow freely, yet always in relation to the initial idea. It's important not to get carried away then, but stay focussed on what the idea was. On the other hand, I like to improvise every now and then, when I don't feel like working on a specific composition. I would just program beats or design sequences or patches and would record them, without any specific piece in mind. Very often then, those improvisations do become starting points for ideas, since they turn into the above mentioned collection of elements. So, in conclusion, I think both methods are very important, yet need to be clearly identified as such and used in the correct moments. I'm not sure what you mean by 'space', so I'll just focus on sound and composition. Now, sound and composition are two parameters that have always been close, yet ultimately during the last maybe 50 years have finally merged into one single thing. Like, when you listen to a composition, let's say of J.S. Bach, it is clear how much he must have been concerned about the sound of it, when for example writing for an orchestra. There used to be, of course, the core of the composition, perhaps a chord progression and a melody, which could always work and be perceived without any specific or determined sound. Then there are pieces which heavily rely on the correct arrangement and then, naturally, the correct placement of the musicians in relation to the listener (orchestra). This has become more and more prevalent during history, up until a point when compositions without a properly designed orchestra were not possible anymore. An orchestra, incidentally is called a klangkoerper in German, which means body of sound. Then, the moment that recording appeared, it became obvious that music, even though still just an abstract composition that could be written down as musical notes, had transformed into something else as the recording and its sound became part of it. During the last couple of decades, especially with electronic music/electricity, this has become more apparent. The new reality is that electronic sound, unlike any other sound, because it is being shaped and most importantly amplified through electricity, transcends into the realm of physics, that is, pure energy. A composition could be a combination and configuration of specific sine waves and it would still be music, yet at the same time, just pure sound. Instead of seeing it as a problem to be solved, that sound, in most traditional opinions, is not considered music, I say that we are standing at the beginning of an era where the traditional understanding of music will transform into something bigger. Sound is not a disadvantage, that one needs to cover up and camouflage by using fancy chord progressions and pretty melodies, so it would be accepted as music, but rather, sound will ultimately replace the limited language of musical notes and transform music into a physical and ultimately spiritual experience for everybody who has felt a 20 Hz sound wave running through his/her body! I think the biggest challenge in any art, is to hide the process of creation from the audience. Apart from the fact that the process of creation is not important for the understanding of the piece of art itself, I think that a big part of the mystery of art has to do with the absence of knowledge about its creation. The mystery enables and even amplifies its effect. The processes and ideas behind my work are only relevant to me. For the audience those ideas might seem mental, logical, analytical ballast that distracts from the somatic, ultimately physical, illogical and abstract impact of music. I wouldn't isolate cultural differences from any other differences that human beings are made of. Especially with music, there is a direct somatic link happening between the composer, the music and the listener, in the sense that something connects. Or not. Yet this 'something' seems to be unrelated to anything we can pinpoint to larger influences, such as a cultural surrounding. Obviously, cultural differences are not unimportant, and sometimes they weigh more than other differences, yet, from my experience throughout the last 20 years, the differences or affinities between audiences or human beings, has more to do with non-cultural influences. We are standing at the beginning of an era where the traditional understanding of music will transform into something bigger.